If you still believe in the album format, and Music Riot certainly does, then the sequence of tracks on the album is important and the opening track should set the tone for the rest of the album: it certainly does here. There are no instrumental pyrotechnics on “Soul Fly Free”, no amps cranked to eleven, just a bunch of great musicians laying down a smooth groove overlaid with Hammond and steel guitar that wafts over you like a cool breeze on a still August day. 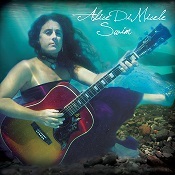 I would normally namecheck most of the musicians, but Alice DiMicele has pretty much used two bands plus a raft of guest musicians to create “Swim”, her thirteenth self-released album so, if you’ll forgive me, I’ll give that a miss this time. It’s also difficult to pigeonhole Alice; she’s had a couple of attempts herself with ‘organic acoustic groove’ but there are an awful lot of other influences there as well. The album’s closing track “Ripple”, a Grateful Dead cover, is pure country, laid back and with some lovely piano courtesy of the legendary Bill Payne. “When Jane Rides Scout”, dealing with the bond between a woman and her horse, has a trumpet solo which adds a Mexican feel to the song, while “If I Could Move the World” (reworked from the 1994 album, “Naked”) is in a slow jazz styling with muted trumpet which evokes out-of-focus neon lights on a misty night and a vocal which is reminiscent of Rickie Lee Jones. Alice is renowned as an environmental campaigner and the album features a couple of songs which use human stories as a framework for highlighting environmental concerns. “Old Life Back” sets the controversial practice of fracking (and the ideology backing it up) against the story of a farmer forced to abandon his farm and move to the city. It’s powerful stuff. “School House” combines a narrative about returning to your roots with concerns about the environmental impact of damming the Klamath River in north-western USA. Alice creates a happy ending by looking into a future where the dams have been destroyed and the river is running its natural course again. Vocally, the pathos of “Old Life Back” and the passion of “School House” combine with simple and powerful melodies to create a powerful message. There are some very personal songs on the album as well. “Inside” deals with the impact of death on those left behind, and the spirit living on in those people, while the uptempo “Open Road” concerns soul mates who are also free spirits and how the apparent contradiction is resolved. “This Love” creates emotion by having Alice sing at the lower end of her range (with a hint of k.d. lang) backed by finger-picked guitar and mellow strings, while “Swim” is unlike anything else on the album. Guitar, bass, Hammond and drums create a swirling, sinuous, funky groove to underpin the vocal, punctuated by stabs and fills from the horn section. You won’t feel your attention wander while you’re listening to this album; it’s diverse both musically and lyrically. It takes you on an emotional journey for the uplifting “Soul Fly Free” through the harrowing “Inside” to the ebullient and irrepressible “Swim”. It should make you think a little bit along the way as well. Out on Monday May 4th. Available from CDBaby or iTunes.